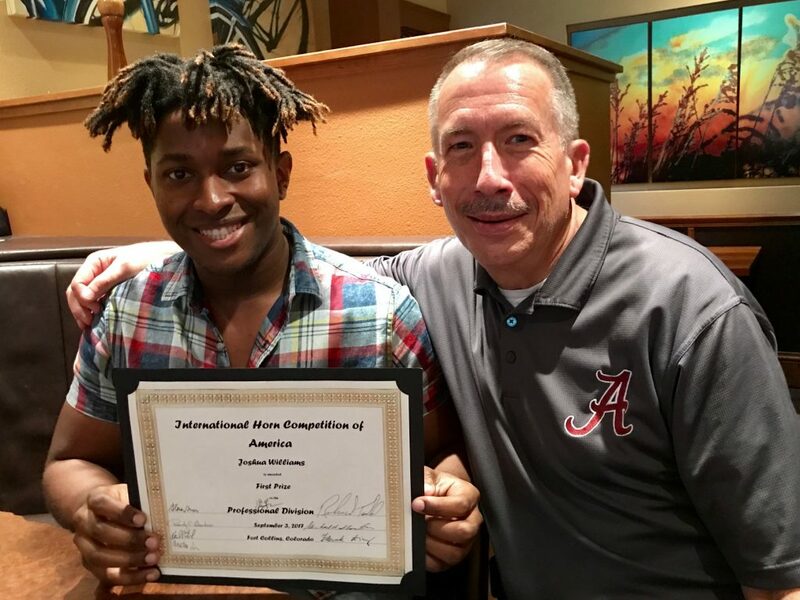 Titles like “best of the best” and “best in the world” still don’t sit well with University of Alabama doctorate of musical arts candidate Joshua Williams. 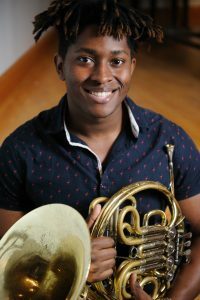 But, the 25-year-old Tuscaloosa native will have to get used to them, because on Sept. 3 the French horn virtuoso won first place in the professional division of the International Horn Competition of America held in Fort Collins, Colorado. For horn players, it’s one of the highest achievements in the world. “It happens every two years, bringing in horn players from multiple continents who are literally the best of the best at what they do,” said Charles “Skip” Snead, director and professor in the UA School of Music. Snead said William’s achievement is among the most monumental in the 100-year history of The University of Alabama’s School of Music. “For someone to win the top honor in their discipline is very rare, and that’s something many schools cannot say has ever happened in their history,” he said. Williams said he still hasn’t grasped the magnitude of the win. The professional division of the competition started with 30 competitors from across the United States, Asia, Europe and South America. After the first round, seven semifinalists remained. And then there were three: Markus Osterlund, a highly decorated player and member of the National Symphony Orchestra in Washington, D.C.; Jorge Mejia, principal horn of the Bogotá Symphony Orchestra in Bogotá, Colombia, and one of the most widely recognized South American professional horn soloists of this generation; and Williams. Williams said he went into the competition with a two-pronged strategy. First, he didn’t come to compete against the other performers. In fact, he didn’t even listen to their performances. The second part of his strategy was simply not worrying about giving a perfect performance. Instead, he concentrated on telling a story. “I went in thinking that it wasn’t about competing, but it was about creating music and sharing my music with the audience. I think that attitude carried me through the competition. The win came with $3,500 in award money, membership in the Laureates Council of preeminent international solo competitors, enormous publicity and opportunities to perform around the globe. “Life has changed a lot in the last few weeks,” he said. “I’ve been invited to be a guest performer and featured artist in various workshops, most notably the International Horn Summer Symposium, which is one of the largest gathering of horn players in the world. Williams started playing French horn in seventh grade at Hillcrest Middle School. Due to a mid-year change of schools, he couldn’t play sports, so he joined the band. His dad suggested he play the French horn because he wasn’t interested in buying him an instrument at the time and the school had a French horn he could use. Though he felt like he had a natural knack for the instrument, it wasn’t until he got to Hillcrest High School and met band director Andy Pettus that he decided to pursue a music career. Williams said he also owes a great debt of gratitude to the Sneads. Snead’s wife, Angie Snead, was the one who first heard him play in the ninth grade and connected him with her husband. Williams and Skip Snead began to take private lessons together and they’ve been together since. The Sneads also influenced his decision to stay in Tuscaloosa and attend the music school at UA where he attained his bachelor’s and master’s degrees in horn performance, is a candidate to attain his doctorate and teaches an introduction to listening class. Now that he’s reached the top, it would seem that there’s nowhere else to go. But Williams said he has many other goals that he’s working to accomplish.